The San Diego Chapter of the Association of Fundraising Professionals (AFP) is delighted to announce the 2019-2021 Colette M. Murray Fellows Scholarship. The Colette M. Murray Fellows Scholarship is an outreach initiative of the AFP San Diego Chapter to encourage diversity within our profession by offering incentives for AFP membership to persons who are members of a diverse community and/or those working for nonprofit organizations in San Diego County serving diverse communities. These include, but are not limited to, ethnic, economically challenged, LGBT, age-defined, or physically disabled communities. In addition, the chapter seeks to have a broad representation of fundraisers from the various sectors of the nonprofit spectrum (arts, health, environment, animals, etc). The chapter’s objective is to offer our educational resources and the collective professional expertise of our membership – in accessible and user-friendly formats – to assist individuals in building their organization’s capacity and professional fundraising skills. 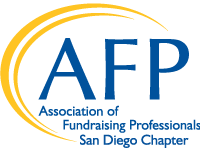 The Chapter’s ultimate goal is to encourage greater numbers of persons from diverse communities and/or serving diverse communities to become active members of AFP San Diego, AFP International, and our profession. We believe the result will be of significant mutual benefit, with the chapter demonstrating AFP’s value to those not familiar with AFP, and with the Fellows assisting AFP, both at the chapter and international levels, to be more responsive to their needs and to those of the wider fundraising community. Complimentary ticket to annual AFP National Philanthropy Day (approximate value: $85). Regular attendance at luncheons and workshops is expected. Participate as a volunteer for National Philanthropy Day and the AFP International Conference when it is hosted in San Diego. A link to the 2019 application will be available on our website May of 2019.